After an easy flight from Hong Kong, I landed at Tribhuvan International Airport in Kathmandu a little after nightfall. The flight was packed, but, being the ‘savvy traveler’ I pretend to be, I had selected a seat towards the front of the plane in order to avoid the crowds at Passport Control and Immigration. Once we docked at the gate, I quickly grabbed my carry-on backpack and made my way down to the luggage area. First impression- I was shocked at how rudimentary the airport was. Again, I didn’t really know what to expect, but thought “It’s the capital city, the only international airport in Nepal- its got to be somewhat modern.” False. It turned out to be a dusty and dimly-lit brick building, yellowed linoleum lining the floors, pale fluorescent lights flickering overhead. It consisted of only two rooms- an Arrival Hall, where luggage came rumbling in on an ancient conveyor belt, and the Immigrations Hall, with a grand total of 2 passport checkpoints. There were a few familiar-looking devices that I think once upon a time may have passed as metal detectors, but I don’t think they were functional, or, even worse, plugged in. As I began to dig into my wallet for more rupees, the man in charge came over, went through my passport and papers, and shook his head. “American dollars” he said, with a thick accent. “American dollars?” I replied. “For what?” I thought they were asking for some sort of bribe, a little ‘tip’ to expedite the visa process- not unheard of in the far-flung corners of the world. I had a few bucks in my wallet, and in an effort to facilitate the process, handed the guy a $5 bill, hoping that would satisfy him. It did not. “No rupees. Only dollars,” he stated flatly, and handed me back all of my money, $5 bill included. “Only dollars?” I questioned, totally confused. He nodded, pointing to a smudged, hand-written sign with crumpled edges, posted at the checkpoint almost as an afterthought. “Tourist Visa: $30 US Dollars”. I read it, and again, having done the math in my head, extended the fistful of rupees towards him. “$30 dollars, in rupees,” I said. “NO RUPEES. ONLY DOLLARS,” he said again, a bit more sternly this time. It still didn’t click- it seemed like the guy was telling me they wouldn’t accept their own currency for payment for the visa, but that couldn’t be right, could it? Turned out, that was EXACTLY what he was saying. Apparently, rupees were no good in Nepal, at least not in the airport. As this dawned on me, I found myself facing another, more serious problem. “I don’t have $30 dollars IN US dollars.” Uh-oh. The guy refused to take the rupees, the woman stared at me blankly, and the people in line behind me began to get impatient. Now, I’ve always taken pride in being a ‘Prepared Traveler”, someone who has done the research and is never caught off-guard when extenuating circumstances present themselves. This caught me off guard. I didn’t have $30US cash on me to pay for the visa, and it was readily apparent that the agent was not going to take any rupees, nor a combination currencies. Furthermore, the prospects of me getting my hands on $30US there in the dimming Kathmandu airport were less than promising. The lady handed me back my passport and papers and went on to the next person in line, leaving me standing there, wondering what to do next. I started by asking others in line if they could swap US dollars for rupees, but either no one had enough or no one was willing to exchange with me. I looked around the two rooms for anything that could pass as a currency exchange or bank- nothing. No ATMs, no Information Desk, no shops or food stands- NOTHING. I was beginning to get a bit panicky about how I was going to come up with $30 cash, when the female agent at the other desk had an ounce of pity for me- she discreetly motioned downstairs and said “ATM outside.” “American dollars?” I asked. She nodded quickly, and I was off. To get outside meant passing through security, where they were checking everyone’s passports for appropriate entry visas. I tried to explain the situation to the security officer, but he was not budging. I went back to the passport desk, but all she said was “Hurry- bank close soon!”. Great. Now I was in serious danger of having to spend the night in the Kathmandu Airport- not a good scene. Back to the security checkpoint, I discovered that the guard wasn’t there anymore. Actually, no one was checking anything, so I hurried through the gate and down the stairs towards the exit, essentially entering Nepal illegally. I might have just made a bee-line for a taxi and headed to the hotel, fairly certain I could get away with a month in Nepal without a visa- after seeing the ‘security’ at the airport, I had an inkling I could probably pull it off- but knew I would need to have a visa number to check into the hotel, to book any treks or activities while in Nepal, etc., so began searching for the ATM rather than a taxi. I found it, only to see that it had indeed been closed for the night. Locked up, turned off, armed guards at the door. A quick questioning look to see if they would make an exception drew a terse shake of the head and a step to block the door. Ok, that idea was off. I headed back to the terminal, still carrying my massive duffel bag around on my shoulder, along with all of my other belongings. I hustled up the stairs, back through the un-manned ‘security’ checkpoint, and back to the passport control desk. “The ATM is closed,” I gasped, out of breath and sweating from running all over the airport while hauling everything with me. “Try there,” she said, pointing across the dark hall to a opaque glass door with a dim light poring through it. Realizing I was almost out of options, I headed over to see what exactly was behind the door that might help get me out of the airport. I tried the door. Locked. “Awesome,” I muttered to myself. The blinds were drawn, so I couldn’t see who or what was in the room. I knocked, and almost immediately a hand swept the blinds back, revealing a suspicious face peering out at me. “I need to change rupees,” I said loudly through the glass. The man looked at me for a few seconds, said something over his shoulder, and then let the blinds fall back without replying. I waited. And waited. Finally, just when I was about to head back over to the passport desks, the lock clicked and the door opened. I stood in the doorway, peering into a room that appeared to be a shop of some sort, but stocked with only a few cartons of cigarettes and a couple of bottles of vodka on the otherwise empty shelves. There were three men in the room, all sitting around a table, with suspiciously large stacks of various currencies strewn between them. Thick cigarette smoke swirled in the air as the men eyed me warily. The man holding the door motioned me in, and I had to gingerly sidestep him to get through the doorway with all of my bags hanging off of me. “I need US dollars,” I said, praying for a positive response. “How much?” one of them barked. “Twenty’” I said. WIth the two $5s I had in my wallet, that would cover the visa payment. “I have rupees, but they won’t take them.” The man who had spoken grunted knowingly, picked up the calculator that was sitting on the table, punched in a few numbers, and showed me the display. I looked at it, then back at him. It was a RIDICULOUS exchange rate- robbery, some might call it- but he knew I didn’t have any other options. It was either that, or sleep in the airport. I knew there was no negotiating with these guys- it was a take it or leave it situation, a set-up that I’m sure they had been scamming tourists with for quite a while. More relieved to have found an out than I was mad about the exorbitant exchange rate, I handed over the required amount of rupees, and got a crisp, clean, freshly-minted $20 back in exchange. I was shocked- you don’t get money that new IN the United States, much less a developing country half a world away. I knew better than to ask any questions, and thanked them as they curtly ushered me out of the room, adding my rupees to the pile already scattered on the table as the door closed behind me. Shady business, for sure. Relieved, I headed back to the passport desk, went through the rigmarole all over again, and got my visa and entry stamp. The agents just smiled at me, like they knew the outcome all along. Whatever- I was glad to be getting out of there. 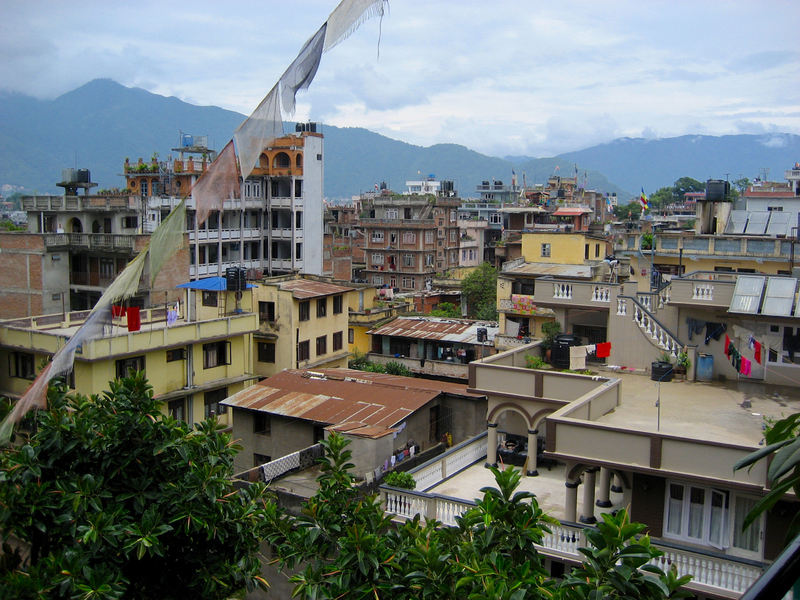 I hurried back through the security-less security checkpoint, down the stairs, and out into the Nepali night. The crowds had dissipated while I had been running around- only a few taxis and a handful of other cars remained. I stood on the sidewalk for a minute, debating what to do next, when the decision was made for me. A door opened on one of the cars, and a small Nepali man came hurrying over. “Mr. Tilley? Mr. Tilley…?” “Yes, that’s me,” I said, relieved to know that the car had waited for me. “Welcome to Nepal!” he said with a huge smile and a handshake, patting me on the shoulder. “Allow me to take your bag, sir!” he said. My bag was as big as he was, and probably weighed more as well, but he wouldn’t let me carry it another step. He slung it over his shoulder and half walked, half staggered to the back of the car. I helped him get it in the trunk, then clambered into the front seat (at his insistence), as he slid into the back. “Welcome to Kathmandu, gateway to the Himalaya!” said the cheerful driver as I climbed in. After all the hassle at the airport, I took a long, deep draught of the foreign mountain air. “Thank you very much,” I said as I closed the door. “I’m just happy to be here…” And I was.